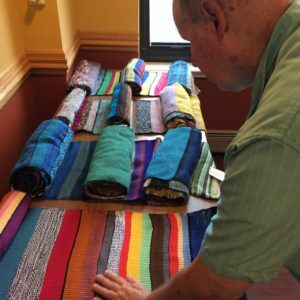 Weavers at Friedman Place teamed up with textile artist and educator, John Paul Morabito, to create a series of woven tapestries that tell the story of our residents’ unique exploration of color and blindness. Color is among the most visual phenomena. Among the elements of form, color stands out as the least tactile – red and blue feel no different to touch. What, then, does it mean for a blind community to explore color? For people with blindness, color is as nuanced and varied as it is for those with sight. 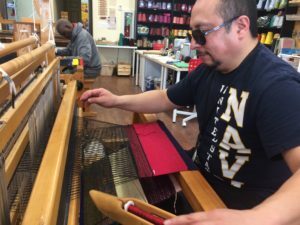 The weavers at Friedman Place have different levels of visual impairment; some have no sight at all, while others have limited sight. There are those who lost vision later in life and those who have been blind their entire lives. Reflecting this, color might be an experience remembered or a phenomenon only understood through language and cultural signifies. Stripped of its visual effects, color still retains its emotive qualities which the weavers have articulated in a series of five striped tapestries. Monthly community discussions were held to serve as an incubator for the exploration of the dialectal relationship between color and lived experience. This began with a call for personal associations with particular colors. When asked about the meaning of yellow, the resident called out associations; the sun, bananas, lemons, traffic lights, Easter, butter, pineapple, etc. Building off this free association, six themes were developed. During initial discussions these themes were formal, material, and exploratory. However, as the project moved forward the themes became increasingly community oriented, reflecting the collective nature of the project and the values of the weavers. 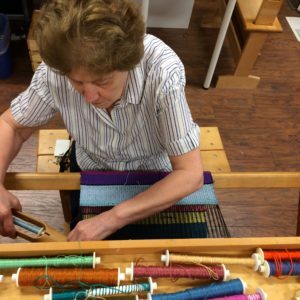 Throughout history and across cultures, weaving has been a community effort and is as much about humanity as it is about material. Exploring eight themes, the tapestries were woven collectively by the community at Friedman Place. Building off the surrealist drawing practice of exquisite corpse, different weavers would come to each loom adding their own interpretations of a given theme onto what was previously woven. The resulting striped cloths hold that narrative in every line of thread. Weaving by its nature is indexical, the sedimentary build-up of weft records time as it constructs the cloth. Accordingly, these stripe compositions become material documents, commemorating a time, a place, and the people that make a community. The themes of the eight community woven tapestries are: My Personal Color, Rainbow/Kaleidoscope, Disco Ball, The Colors of Music, Flags, Party/Friendship, Water As Life, and Memorial. These tapestries will be on display at Friedman Place from October 17 – October 31, 2018 from 9:00am – 6:00pm. All are welcome to our Opening Event: Celebration of the Arts on Tuesday, October 16, 2018 from 5:30pm – 7:30pm. The opening event will be the first time our Community Woven Tapestries will be on display for the public.